I was 40 minutes early for the class, waiting impatiently at the gym where it was held and playing with possible scenarios involving my impending interaction with Marcos, neither of which included a word about having got there early or having rehearsed what to say. When the smiley instructors arrived and greeted the students, Alexa – more inclined to dealing with the public than the quiet Javier, I gathered – noticed my new face, came over to introduce herself to me and gave me a form to fill out. — ‘Did someone recommend us to you?’, she asked. — ‘An Argentinean guy?’, I tried to supply more information. Her eyes turned up but she remained silent, no sign of recognition – blank. — ‘Tall, young?’, I tried again. They took us to a room upstairs and the class started without Marcos. It moved fast from the warm up: we practiced adornos that got gradually more complex as we did our first walks around the room. 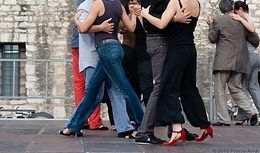 When the warm up was over, the class was shown a sequence of steps and us ladies were told we should improvise with the adornos as the guys led us. I wasn’t comfortable doing them on my own, so I wasn’t looking forward to adding the embellishments to the movement. As there were more ladies than leaders, I stepped back and waited for the next round to start. It wasn’t waiting exactly. Alexa came to train the adornos with me and another lady in front of the mirror. She was sweet and thorough as she demonstrated the movements and corrected our posture but what looked light and graceful on her did not translate as well on my body. I felt as if I walked with orthopedic shoes while others floated on clouds and everyone had noticed it by then. —- ‘Sorry.’, I said awkwardly. —- ‘It’s ok. Uhh let’s try again’, he stopped and looked at Alexa’s direction. She was helping a girl so he continued in Spanish as he demonstrated the move to me ‘try to bring your attention to your body’. —- ‘It’s ok, I understand.’, I replied in Spanish. His face lit up. He cracked on showing me the muscles I should be engaging, how I should feel it on my thighs and the difference from performing it mindfully, engaging my whole body in the movement. Javier was evidently a trained dancer, not only tango, but classical, contemporary… and he was very serious about it. He gave me precise instructions and brought my focus back on my body, the music and the classroom as he challenged me to respond to his body. I was finally there and the happiness of getting things right and dancing soon caught up with me. I did not understand it immediately and my face surely showed it. I tried again, but something stopped me. Javier had earned my full respect as an instructor but he intimidated me and following his breath – as well as his instructions and his body – felt too close. Fabian and the memory of how we connected dancing came to my mind, making my breath short and shallow, as it followed its own chaotic pattern which did not resemble Javier’s at all. The body was ok, though, so he let me off that time. —- ‘Was everything ok?’, Alexa asked me when the class finished. Marcos never turned up, leaving me puzzled and disappointed. All the adrenaline, the waiting in vain. Again! Okay, the forró was long shot, but this class was his idea and we had agreed on it! Had I got the wrong night? Maybe he had forgotten or had had a problem? Oh, more waiting! ‘Aries and impatient’, he had rightly said, so why wasn’t he there?